Web 2.0: eBay, Blogger, Twitter...name your web based poison which keeps your head craned over your laptop or iPhone, spending hours communicating with others you may never meet...seeing places your feet may never touch the ground of. But in the center of all this Web 2.0 thing is trust, believe it or not. The entire predication of eBay's business model as an example, beyond creating impulsive buying patterns through 'Buy Now', is trust. I sell something, you buy it, you tell the world that I am not a wanker and what I sold was what I said it was. You grade me and I'll grade you. Trust. The blogosphere is a lot like that. I met Timmy and Jay-RAD not only from racing, but a lot because their words spoke to me. But, I get to see them weekend in and out as we trade paint in the dirt. 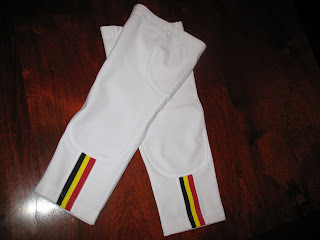 But one blog in particular blew me away: Belgium Knee Warmers. I've said it a zillion times on this here blog how Radio Freddy gets right. He's the creator of PRO and talks openly about the small things in cycling that we all 'see', but likely take for granted. How to wash your bike; the style of a cyclists knit cap in the 60's; white bar tape ALWAYS matching the white seat....and ONLY in the Spring. Classic reads. He calls out the weenie-ness in us all and ensures we respect, embrace, and love our cycling roots. REAL BELGIAN KNEE WARMERS!! And a small note. Just a small note that said.. They are SICK. Made by Rapha....the new PRO style in cycling funk. Mr. Radio Freddy, THANK YOU SO MUCH for that man. Trust. I thank you for the trust that bloggers truly get. A package of the M & C love is on its way. More people should start to trust each other. It's quite fun living life this way. and only for framing, as no real pro apart from the Cippolini-esque would be caught dead with those.